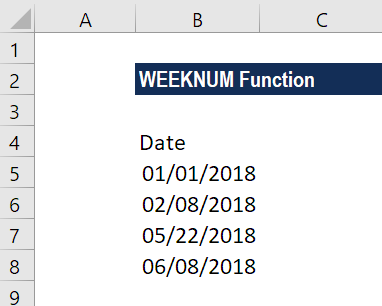 What is the WEEKNUM Function? 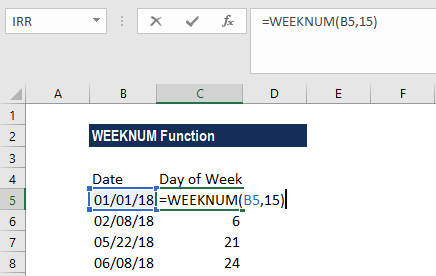 The WEEKNUM Function is a DATE and TIME FunctionFunctionsList of the most important Excel functions for financial analysts. This cheat sheet covers 100s of functions that are critical to know as an Excel analyst. It will return the week number of a specific date. The function will return an integer that represents a week number from 1 to 52 weeks of the year. WEEKNUM is quite useful in financial analysisAnalysis of Financial StatementsHow to perform Analysis of Financial Statements. This guide will teach you to perform financial statement analysis of the income statement, balance sheet, and cash flow statement including margins, ratios, growth, liquiditiy, leverage, rates of return and profitability. See examples and step-by-step instruction. Suppose we wish to determine the time required to complete a certain project, it can be used to remove weekends from the given timeframe. Thus, the function is particularly useful when planning and scheduling work for the business projects. Serial_number (required argument) – It is an excel date for which we want to return the week number for. While entering the argument, we should enter date using the DATE function or as a result of other formulas or functions. Return_type (optional argument) – It specifies which numbering system should be used and which weekday should be treated as the start of the week. System 2 – The week containing the first Thursday of the year is numbered week 1. 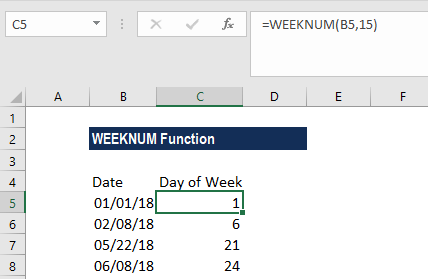 How to use the WEEKNUM Function in Excel? Suppose are given the following dates. Let’s see how we can get the week number from the dataset. Here, we took the return_type argument as 15, which means it will take Friday as day 1 of the week. It calculates the date of the last Monday in the previous year. C5*7 adds the number of weeks multiplied by 7 (the number of days in a week) to get the Monday (start date) of the week in question. The formula is based on the ISO week date system, where the week starts on Monday and the week containing the 1st Thursday of the year is considered week 1. #VALUE! error – Occurs when either the given serial_number is non-numeric or cannot be recognized as a valid date. The given return_type argument is not the value permitted by the function. The given serial_number argument is numeric but is out of the range for the current date base.